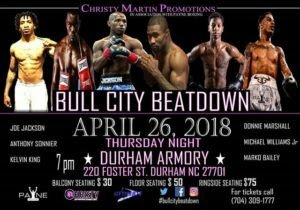 World renowned, Female boxing superstar, Christy Martin and her successful boxing promotional company Christy Martin Promotions invades Durham, North Carolina Thursday, April 26, 2018, with The “Bull City BeatDown” fight card featuring the best North Carolina Boxers. Martin, who is from West Virginia and fought professionally under the nickname “The Coal Miner’s Daughter,” is the most successful and prominent female boxer in the United States. Martin legitimized women’s boxing in the 1990’s, was featured on the cover of Sports Illustrated, fought on Don King promoted cards, and was featured on numerous undercards of Mike Tyson fights. Martin was the “FIRST” Female PPV star and she historically held the WBC Jr Welterweight greenbelt successfully defending it seven times. Martin began fighting in 1989 and fought her last fight in 2012. Martin finisher her career with a record of 49-7-3 (31 KO’s). In 2016, Martin became the first female boxer inducted into the Nevada Boxing Hall of Fame. Martin is continuing her success in boxing. This time, outside of the ring as one of the best promoters in the country. The 2017 North Carolina Promoter of the year Christy Martin and Christy Martin Promotions in Association with Payne Boxing is bringing the “Best” of North Carolina boxing to Durham, NC on Thursday, April 26. The Durham, NC card billed as “Bull City Beatdown” features the 2017 North Carolina Fighter of the year “Dangerous” Donnie Marshall 7-0 (5 KO’s) vs Ronald Montes, Hometown favorite and participant in 2017 North Carolina Fight of the year, Marko “Bull City Bully” Bailey 5-1 (3 KO’s) vs Ace Samples, and Jamaal Gregory vs Joseph Mullin. The “Bull City Beatdown” is also scheduled to include the greatly anticipated ring return of North Carolina’s extremely talented young boxer in Kelvin King 1-0 (1 KO) vs Charlotte stud Mike White. With some of the most promising North Carolina boxers, including the “KiloWatt” smile and talent of Michael Williams Jr vs Xavier Ford on the card, tickets will go fast. Tickets for this monumental event promoted by Christy Martin Promotions in Association With Payne Boxing are priced at $30, $50, and $75 are on sale now. Tickets are available by calling (704) 309-1777. You can also Purchase tickets by contacting your favorite fighter via Social Media messaging and requesting tickets.